Studbook Champagne Register: mares & stallions - must have 2 registered parents. Proof must be provided. Must PASS conformation standards. Non-studbook Champagne Register: mares & stallions - either one or both parents are unknown / unregistered / unproveable. Must PASS conformation standards. These champagnes have full showing rights. Must be a genetic champagne dilute. Be permitted white markings on the face and legs only, the legs not to be white above the knees or hocks save for a continuous diminishing spear or stripe running above the knee or hock. NO champagne may have ANY white markings (ie belly splashes) other than those permitted under the Regulations of the Company. Notwithstanding this, an owner may apply to have a horse or pony accepted for registration under the company's hardship clause which allows for small amounts of underbelly white. AMBER CHAMPAGNE - The Champagne gene acting on a bay base creates an Amber Champagne horse, which looks, in many ways, like a buckskin or dun with brown points. But the newborn foal will have bright pink skin and bright blue eyes. The skin remains basically pink throughout its life, developing freckles on the muzzle, around the eyes, and on its "private parts" as it matures. The tan-colour coat is darker at birth than at maturity, unlike most non-Champagne colours. The newborn-blue eyes on these beautiful tan horses will turn first green, then usually a shade of "amber"... but not the dark brown or black of a buckskin or dun. And, of course, the dorsal stripe and leg barring, etc. of the dun is absent unless the horse also carries the dun gene. The mane and tail of an Amber Champagne, however, will never be truly black, but, rather, a dark brown shade. And though the lower legs of this bay-based horse will be darker than the body, they are often not even as dark as the mane & tail, and, of course, are a shade of brown, and not black. Sometimes the darker shading of the lower legs of an Amber is hardly even noticeable. SABLE CHAMPAGNE - The Champagne gene acting on brown creates a Sable Champagne horse. These horses may resemble amber champagnes but DNA testing will reveal that they carry brown agouti not standard agouti. CLASSIC CHAMPAGNE - The Champagne gene acting on a non-bay, black base creates a rare Classic Champagne horse, which looks, in many ways, like a buckskin, brown, or dun horse with darker brown points. The newborn foal will have bright pink skin and bright blue eyes. The skin remains basically pink throughout its life, developing freckles on the muzzle, around the eyes, and on its "private parts" as it matures. The taupe or mocha-coloured coat is darker at birth than at maturity, unlike most non-Champagne colours. The newborn-blue eyes on these beautiful dark horses will often turn first green, then usually a shade of "amber"... but not dark brown or black. The mane and tail of a Classic Champagne, however, will never be truly black, but, rather, a dark brown shade. And though the lower legs of this black-based horse will be darker than the body, they are often not even as dark as the mane & tail, and are, of course, a shade of brown, and not black. GOLD CHAMPAGNE - Champagne acting on a chestnut base creates a Gold Champagne horse, which looks, in many ways, like a Palomino. The foal will have bright pink skin and bright blue eyes at birth. "Real" Palominos are sometimes born with blue eyes and pink skin, but they usually change very quickly to the characteristic, and required, darker skin and eyes of the true cream-gene-based Palomino. The skin of the Gold Champagne, however, remains basically pink throughout its life, developing freckles on the muzzle, around the eyes, and on its "private parts" as it matures. The golden coat is darker at birth than at maturity, unlike most non-Champagne colours. The newborn-blue eyes on these beautiful golden horses may turn green, then usually a shade of "amber"... but not the dark brown or black of the usual Palomino. 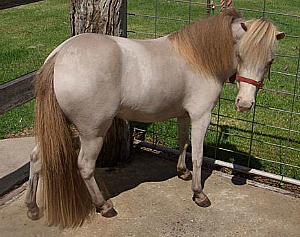 The mane and tail may stay the same shade of gold as the body, or they may be flaxen like those of a Palomino. AMBER CREAM CHAMPAGNE - cream and champagne on a bay base. SABLE CREAM CHAMPAGNE - cream and champagne on a brown base. Any combination of champagne with pearl will be registered as a pearl due to the extreme rarity of the pearl dilute.